Brushed stainless steel with blackened bronze plated finish. 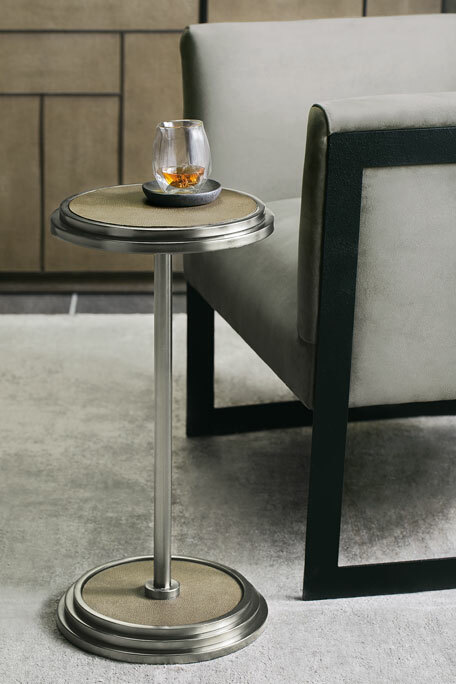 Top and base are inset with faux-shagreen in dark taupe. Handcrafted accent table. Welded metal frame. Top is 0.4" clear tempered glass with 0.5" bevel. Shelf is 0.3" pierced metal. Handcrafted accent table. Welded metal frame. Top is 0.4" clear tempered glass with 0.5" bevel. Shelf is 0.3" pierced metal. 18"Dia. x 25"T. Imported. Boxed weight, approximately 41.8 lbs. Cast iron base with hand-painted Talavera tile top. 26"Dia. x 27"T. Imported. Boxed weight, approximately 135 lbs.